The key to the successful development and implementation of equity-focused interventions in a local community is to assemble a diverse and effective coalition that is of and for the community. Many organizations have an assembled coalition, have many coalitions, and/or have numerous iterations of coalitions. Is the current coalition effective? Do the members include community members and residents? Are members ready and willing to approach equity initiatives with a renewed vigor and appetite for change? In the READY stage, existing and burgeoning equity coalitions must be considered with a critical eye. 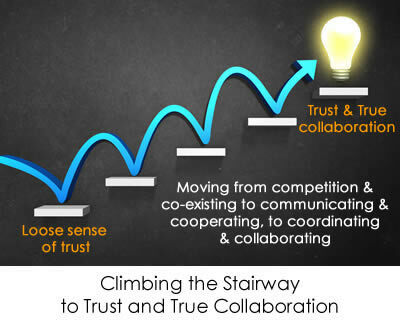 Tamarack: An Institute for Community Engagement sees collaboration as a spectrum that runs initially from a loose sense of trust to increasing levels of trust and finally to true collaboration. The looser end of the spectrum describes the situation in which many organizations find themselves: sharing information and loosely working together, all while competing for resources and laying claims. To build and maintain a coalition that can affect change within a local community, steps must be taken to create a common agenda, develop shared and consistent measurement, mutually reinforce activities, and engage in continuous communication. The following topics will lead you through steps needed to build your coalition. Please use the Read More links to learn about each step and for additional resources. Who is At Your Table? Who is Missing? Assess your current coalition, or the one your organization plans to build, and consider who sits among you at the table. Do you see diverse stakeholders? Do you see community members, businesses, and residents? Do you see the health and public health sectors represented, as well as a variety of other sectors with resources and ideas to offer? Making progress on multifactorial problems such as infant mortality requires a multifactorial team. Click Read More below to access tools that can help determine who is and should be at the table. Stakeholders Wheel. This interactive wheel allows you to map out stakeholders that are currently represented on your team, those you've contacted, and those under consideration. Note: this opens in a new browser window (make sure that your browser allows pop-ups). Tennyson, R. (2011). The partnering toolbook: An essential guide to cross-sector partnering (4th ed.). The Partnering Initiative. Consider partnering up with your local Healthy Start coalition! Community businesses see families everyday. Connect with local businesses to see how they can help! Plan coalition meetings for dates and times that work for community residents. Consider evenings and weekends. Collective Impact is an approach developed with the idea that, “large-scale social change requires broad cross-sector coordination…” (Kania & Kramer, 2011). This section will help you identify the conditions of a true Collective Impact process and how to align with different sectors including government, non-profit, philanthropic, and corporate partners. For an overview of Collective Impact’s Five Conditions, click Read More below. Kania, J., & Kramer, M. (2011, Winter). Collective impact. Stanford Social Innovation Review. As your coalition evolves, it is important to consider the infrastructure, or the backbone, of the coalition. The Collective Impact approach suggests that an outside organization, not one participating in the coalition, makes an ideal backbone organization. This may not always be feasible, and in the case of many Equity Institute teams, the local health department was the backbone organization and a coalition member. For information and tools that can help you identify and support a successful backbone organization, click Read More below. For support in identifying and acting as a backbone organization, you may find the Tools for Backbones toolkit useful. Additional resources are listed below. Tools for Backbones. Collective Impact Forum. This toolkit includes a number of tools for establishing the infrastructure of a Collective Impact Backbone. This toolkit includes a list of sample backbone activities, a working group meeting planning and execution checklist, a sample request for proposals for a backbone organization, and sample backbone position descriptions. Navigating the Funder/Backbone Relationship – Panel Discussion. (2015). Collective Impact Meeting Video Recording. 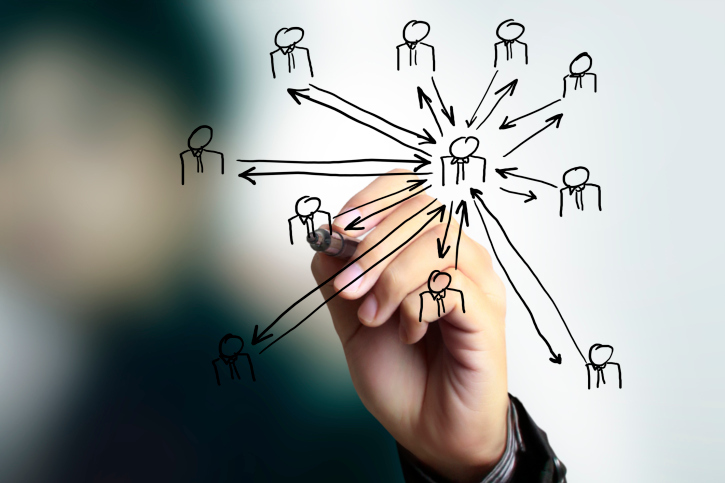 The Collective Impact approach depends on the cohesiveness of a team. In the READY stage, your coalition will work together to create a common agenda. Through this activity, coalition members will learn and understand others’ perspectives on the communities' most pressing health issues and bring diverse stakeholders to a common mission, set of goals, and measurements toward success. Phillips, D. & Splansky Juster, J. (2014, Spring). 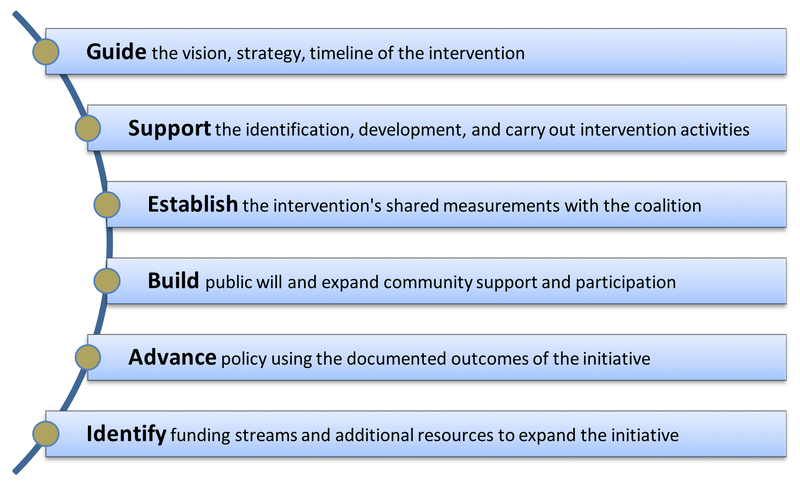 Committing to collective impact: From vision to implementation. Community Investments, 26(1), 11-17. Mattessich, P., Murray-Close, M., & Monsey, B. (2001). Wilder collaboration factors inventory. St. Paul, MN: Wilder Research. University of Kansas Community Tool Box for Key Activities in Community Work.